My friend and colleague Simon Greenhill handed in his PhD thesis today. Having read bits of it, seen the results of other bits of it, and generally parasitised off his hard work in creating and maintaining the Austronesian Basic Vocabulary Database, I feel quite certain it’ll be a bestseller. But seriously: congratulations, Simon, bloody great job! A major medical row will erupt this month when scientists and health experts hold two key meetings to discuss the controversial subject of marriages between cousins and their impact on health in Britain. Really? I love the clairvoyance afforded to newspaper journalists. They obviously also considered that by Monday morning this article hadn’t made waves enough, as the title has been changed to “Row over health risk”. Some researchers and politicians say inter-cousin unions, which are highly prevalent among British Pakistanis, have led to a striking rise in the incidence of rare recessive disorders, many of them fatal, in areas such as Bradford. The trend has led to calls for cousin marriages to be banned. “you have a child with your cousin, the likelihood is there will be a genetic problem”. That last from an environment MP, who is presumably drawing this conclusion from an episode of the X-Files. marriage patterns adopted by people for a variety of reasons, but more importantly, the risks of genetic problems with offspring are identifiable and manageable. Genetic knowledge is useful. The unilateral prescription of social norms by one group in a multicultural society, based on thin-edge emotional judgments and ignorance about cultural diversity – this is not useful. It is also just dumb. 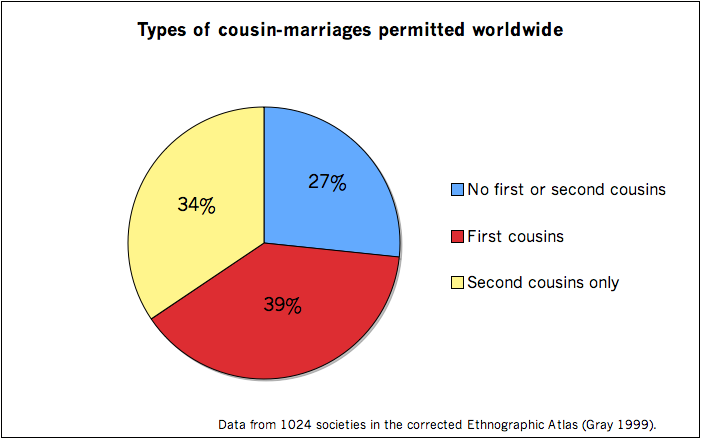 Around the world, marriage to cousins is more often permitted (or preferred!) than it is not. Here are some data. The blue section (not even a third) contains those societies in which marriage to first or second cousins is NOT permitted. The other two allow some form of marriage to cousins, with the red slice indicating the percentage who allow first cousin marriages. These figures are from the Ethnographic Atlas, which contains information about 1267 ethnographically described societies. Some 243 societies had missing data for this category, but ~1000 is a good sample of the world’s cultural diversity. An argument for––or against––cousin marriage does not gain any moral weight from these numbers. The existence of such cultural diversity, however, begs the question to those who are opposing cousin marriage on genetic grounds: where is your evidence for large-scale, worldwide problems with recessive heritable disorders arising from cousin marriages? Though there are no direct data, one might argue that if at least a third of human societies can maintain such a marriage preference, it implies that any genetic problems are not so severe as to be cumulatively damaging for all individuals. And that is another point: just because a social group permits cousin marriage, it does not follow that every individual in the group marries their cousin. Population thinking seems to be very hard for many people to grasp. It appears to me that there is not much science going on with any “call” for banning cousin marriage, but something more like prejudicial gut-reactions combined with availability heuristics. That’s just speculation, however. But I’m still confused about that major medical row. What was the point there? With thanks to Aamra Darr for a clarification. Hope that worked out for y’all, people!